Grantown on Spey Golf Breaks. Grantown on Spey Golf Breaks. 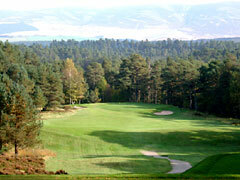 Grantown-on-Spey Golf Club, Established in 1890, Grantown-on-Spey Golf Club welcomes individual players and societies. Located in the beautiful Spey Valley, the course is a mixture of parkland and woodland with many magnificent views towards the Cairngorm range and the Cromdale Hills. Walking is relatively easy and the course presents a fair challenge for every calibre of golfer. 18 holes. Par 70. 5,710 yds. Parkland / Woodland. The Craiglynne Hotel. Woodlands Terrace, Grantown-on-Spey PH26 3JX, Scotland. A handsome stone-built Victorian hotel standing within its own grounds on the edge of Grantown on Spey. The Craiglynne overlooks parkland to the forest and the River Spey beyond. The Craiglynne provides an excellent standard of accommodation with an atmosphere of old world charm, maintained by the many open log fires. The hotel's gardens, in summer, are a tranquil experience as is the comfort of the Geranium filled lounge. Grantown on Spey makes an excellent base from which to follow the whisky trail or discover Loch Ness and Inverness. Find the best deal, compare prices and read what other travelers have to say at TripAdvisor.